Ever since Paul Pierce and Kevin Garnett were traded from the Celtics to the Brooklyn Nets in the 2013 off-season, Rajon Rondo’s NBA playing career has begun to slowly fall apart. His time with the Celtics after the departure of his two biggest mentors and the best players he’s ever played alongside was short lived. He missed a large portion of the 2013-14 season due to an ACL tear that he suffered the year before. When he returned his play was less than impressive as he had a hard time finding an identity with the young, new-look C’s. He then had that mysterious shower/trampoline park injury before the start of last season and missed a few weeks. When he came back his play continued to be underwhelming. In his 22 games with the Celtics last year he looked lost. He managed to average 10.7 assists per game but it wasn’t helping the team win. His 8.3 points per game average was by far the lowest since his rookie year in 2006-07 and his field goal percentage (40.5%) was the worst of his career. His jump shot, which had gradually been improving since he entered the league, looked as bad as it’s ever looked. When Isaiah Thomas came aboard midway through last season it showed how much better a team can be when their best player actually knows how to score. Rondo’s attitude was so bad in Dallas that his coach benched him for their final three playoff games and lied to the media about him having an injury. As if that wasn’t enough the team also decided not to give him a playoff share. Not exactly the way you’d like to deal with your “all-star” point guard but Rajon brought it upon himself. This year he has a new opportunity with the Sacramento Kings. A new chance to show that he can be a good, team player without a couple mature, veteran, All-Star, future Hall of Famers to keep him from acting out. A new chance to develop a relationship with a new coach and work together with that coach in a civil manner to make sure they are on the same page. Of course Rondo getting into it with his coach is nothing new, but I’m pretty sure the best way to handle these issues is to not tell the media about them. I’m not sure what he was trying to accomplish by doing that. 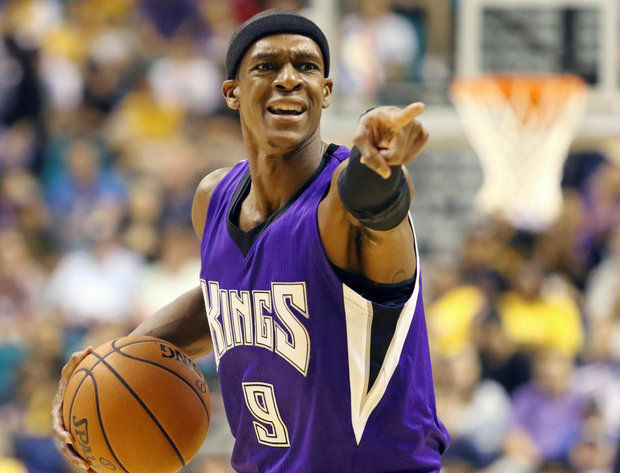 Another thing I couldn’t help but notice from this interview is how badly Rajon Rondo does not want to be on the Sacramento Kings. He’s never been very outspoken in interviews but you could just tell from this interview that he’s not enjoying himself. If he continues this way, it won’t be long until George Karl ships him out of town because of locker room problems. Acting like a privileged superstar when you haven’t had a good season in four years can definitely rub your teammates the wrong way.